Our friend Mark moved to Sydney a few years ago, seeking good weather and giant prawns. I had always fancied a trip to Australia and we were keen to visit him, so in January 2011 we endured the 22 hour flight across the globe. I say endured, but actually we were surprised by how painless the journey was. I think it’s because you’re psychologically prepared and expecting the worst, but I’ve definitely been on more boring and uncomfortable flights. After four films, half a book, plenty of naps and god knows how many meals, we arrived Down Under. Our first couple of days were spent exploring the centre of Sydney. We walked around the harbour, sat on the steps of the Opera House, frequented cafés in The Rocks, visited the Royal Botanic Gardens, and enjoyed a free open-air music festival in Hyde Park. A very pleasant start to the trip. After shaking off the jetlag and getting over the initial shock of paying £8 a beer, we re-boarded a plane and headed to Tasmania. Mark, his new girlfriend (now fiancé) Gill, and fellow Londoner Andy were waiting for us in Hobart, the state capital. A few factoids for you: Tasmania is the 26th largest island in the world; one of the closest inhabited places to the Antarctic; and has an extremely homogeneous population, built up from the families of convicts and their guards alongside nine indigenous Aboriginal groups. The island was originally named ‘Anthony van Diemen’s Land’ by the Dutch explorer Abel Tasman in the 17th century, in honour of the sponsor of his exploratory trip (shortened to Van Diemen’s Land by the British), then later renamed Tasmania in recognition of Abel. Unfortunately, it was pretty grey and wet for most of our time there, so we didn’t see it at its best. A real shame, because the landscape is rugged and beautiful. In particular, I’d have liked to have seen the Bay of Fires illuminated by the sun, with shimmering turquoise water and glittering white sand. As it was, the sea was a dull, muddy colour, reflecting the dark clouds, and I had to zip up my hoodie to keep out the chill. This didn’t stop Mark and Andy from having a dip, though they did look quite blue when they came out! We pootled around the island in a hire car for a week, calling in at various coastal towns and driving through rural beauty-spots like Patersonia, where the people asked after their leader Adrian and we regaled them with stories of his successes in academia. We ate in some less than salubrious places – though the steak the size of my torso in Sheffield was an experience I wouldn’t have wanted to miss – and narrowly avoided a fight with some Aussies while watching an Ashes game in a local bar-come-bingo-hall. The highlight of the trip was Cradle Mountain National Park, where – donning our rain macs and walking boots – we circled Lake St Clair, admiring the waterfalls and lush vegetation…or what we could see of it through the haze and drizzle. It was particularly exciting to spot a wallaby sitting lazily in the rain, not fazed in the slightest by the ‘oohs’ and ‘aahs’ around him. Frustratingly, I came down with a bad cold in Launceston. I was less than impressed with the city anyway – despite Paul’s efforts to look on the bright side, encouraging me to “look up” where apparently the officious, grey, concrete buildings were somehow prettier, I wasn’t feeling it. So the snot really didn’t help. And my coughing and sneezing didn’t win me any friends when, having said goodbye to Mark and Andy for the time being, we caught a plane to Melbourne to start our trip down the Great Ocean Road. Luckily, my cold eased and I was able to enjoy the stunning scenery as Paul drove us along the coastal highway. Our first stop was the Otway Fly “Treetop Adventure” in the rainforested area near Geelong. Those familiar with the similar set-up at Kew will understand the deal: metal walkways and observation desks high above the forest floor. We drove on to Apollo Bay that evening and stayed in a motel near the beach. The bay was pleasant enough, but not the idyllic image I’d had of this stretch of coastline. 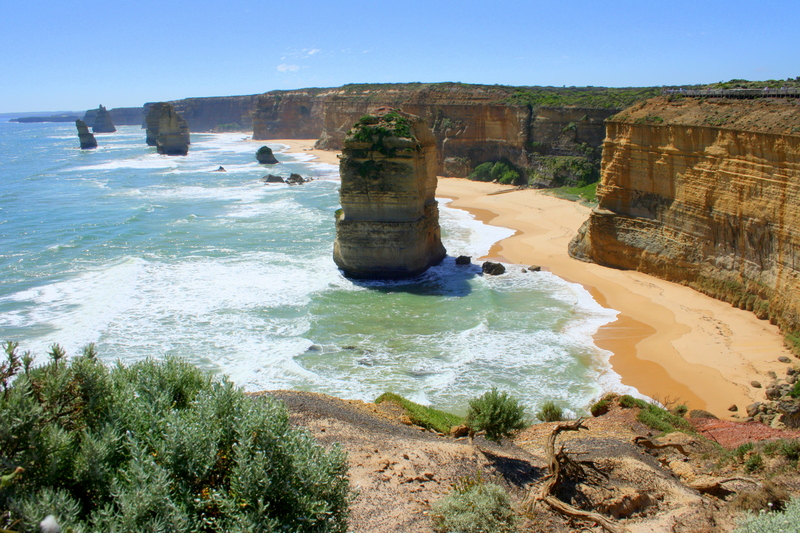 Luckily, I wasn’t to be disappointed the next day, as our journey took us to the Twelve Apostles via Cape Otway. 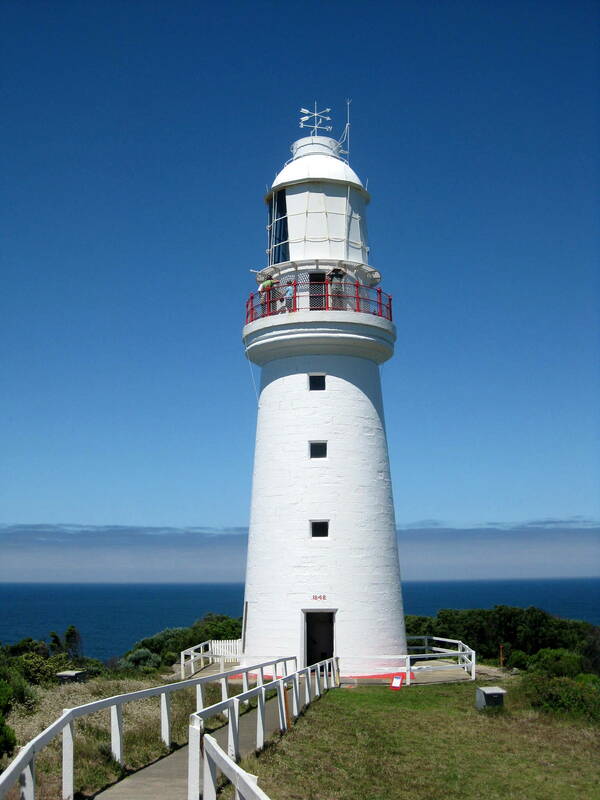 The lighthouse on the cape is picture-perfect and the eucalyptus trees along the road were full of koalas. I love koalas! I was so excited, and kept making a bemused Paul stop so that I could jump out to get a better look and take photos. The mammoth flight from the UK was worth it just for that stretch of road! And the Twelve Apostles were spectacular – a beautiful set of limestone stacks off the shore near the Port Campbell National Park. We dropped down onto the beach and strolled along in the 30° heat, feeling very self-satisfied. The day ended with a stay at Oscars in Port Fairy, by far the best B&B of the trip (and possibly the best we’ve ever stayed in). Pricey, but worth it for the “gourmet breakfast” alone. Port Fairy is a charming little town, where the pace of life is slow and everyone seems to have their own boat moored at their own jetty and frequent the same small restaurants. We bought fish and chips and ate them by the water as the sun set. Aah, happy days. On the way back to Melbourne, we spent a few hours at the Tower Hill game reserve – a protected conservation area inside a dormant volcano. Wild emus, kangaroos, birds, koalas and echidnas roam the area and we had a great time stalking them quietly through the bush and around the lake. Back in Melbourne, we explored the city and ate in some of the most amazing restaurants. Cumulus Inc. serves delicious oysters, charcuterie and fish dishes in a very slick art space on Flinders Lane and MoVida Aqui on Bourke Street is one of the best tapas restaurants in the world. Determined to see the famous penguins on the beach, we also spent a day on Phillip Island. A 90 minute drive out of the city and linked by road to the mainland, the island is a popular holiday destination for Australians, with beaches, walking trails, surfing, a wildlife park, visitor centre, and the all-important birds. We’d not read anything about the park in advance and it turned out to be really good fun. 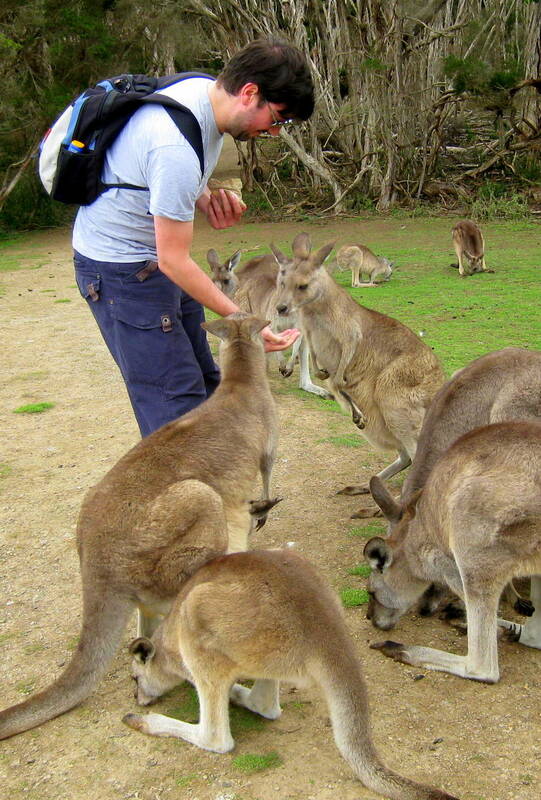 Tons of indigenous animals – red kangeroos, wombats, tasmanian devils, kookaburra, emu, wallabies, cassowaries, dingos – are to be found, many of which roam freely and are happy to be fed by the hand. At one point, Paul found himself surrounded by eight kangaroos vying for his attention – and they are pretty darn big and powerful up close! We also took a stroll along the boardwalks around Swan Lake, spying unusual breeds of bird, and wandered around the coves spotting seals offshore. The main attraction, though, is the foundation set up to protect the island’s colony of 30,000 little penguins. As the sun began to set, we drove to the headland for a prime spot on the beach and watched as hundreds of them popped out of the sea, waddled across the sand, and made their way up the cliffs to their burrows. Very sweet; I just wish there’d been fewer people. Damn those tourists! Tsk. Our next stop was the Northern Territory. The three-hour flight to Alice Springs reminded us just how vast the country is, and when we touched down we better appreciated how climatically, culturally and scenically diverse it is as well. Alice is a tiny, red, hot place, with the feel of a frontier town. Straddling the dry Todd River, it is essentially just a few streets of shops and bars, outside of which sit homeless Arrernte Aborigines mistakenly forced to assimilate with the modern world and now spending their days begging and drinking. The town stands awkwardly alongside the large ‘luxury’ casino hotels on the outskirts, where holiday-makers assemble before their trips into the country’s Red Centre. Being two such tourists, we were soon headed into the outback down long, deserted, dusty roads. Passing the MacDonnell Ranges and then vast areas of red, rocky, almost moonscape land, we arrived at our accommodation for the night – a small motel with a liberal splattering of ‘Beware: Spiders’ signs. I did spot a ginormous one in the ladies, but bravely ignored the panicked yelps of other guests and inched my way under the web to use the facilities. Spiders (including the Funnel Web, TrapDoor and Bird-Eating (yes!) Tarantula) are only some of the many things trying to kill you in Australia – also to be avoided are the crocodiles, snakes, the Great White Shark, cassowary, and Box Jellyfish (the deadliest creature, bar none, on the planet). Good to be kept on your toes. 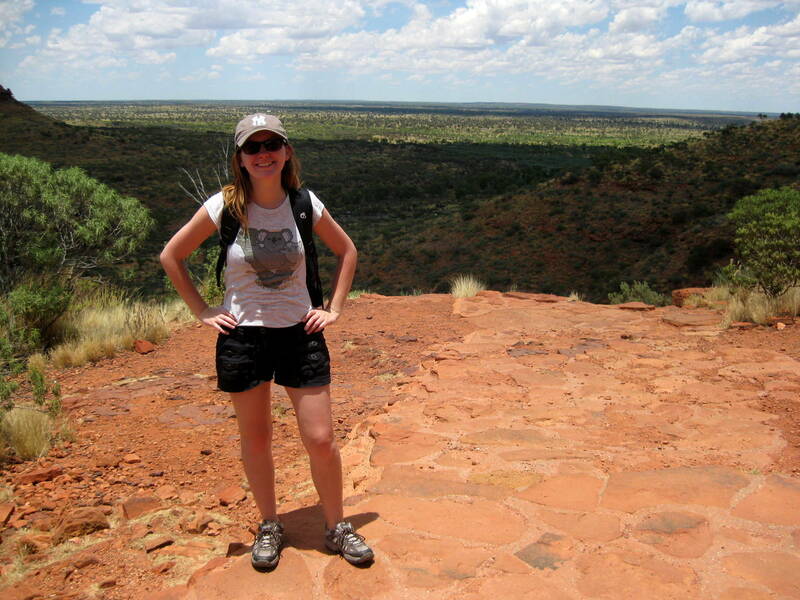 The next day we drove to Watarrka National Park and braved a 12 mile hike around the rim of King’s Canyon. The walk started with a steep climb up ‘heart attack hill’ and went downhill – figuratively speaking – from there! Technically our guide shouldn’t have allowed us to make the trek in the desperately uncomfortable 42° heat, but – even though my asthmatic lungs have never struggled so much – I was really glad to have done it. The views were incredible, the path rugged and adventurous, and we enjoyed a refreshing dip in a waterhole half way round. I’ve never felt as completely isolated and far from civilisation. And it only took three beakers of electrolytes and four bottles of water to see me right at the end! Finally, over 300km from Alice, we arrived at Uluṟru-Kata Tjuṯta National Park. Some more factoids for you: Uluru, better known in the west as Ayers Rock, was created over 600 million years; it originally sat at the bottom of a sea, but today stands 300m+ above ground, the result of erosion and shifting climates. It is approximately 3.6kms long and nearly 2kms wide and the oxidation of its iron content has given it its orange-red colour. The Anangu Aborigines who ‘own’ it have been in the area for the last 10,000 years and currently lease the land to the Australian government. 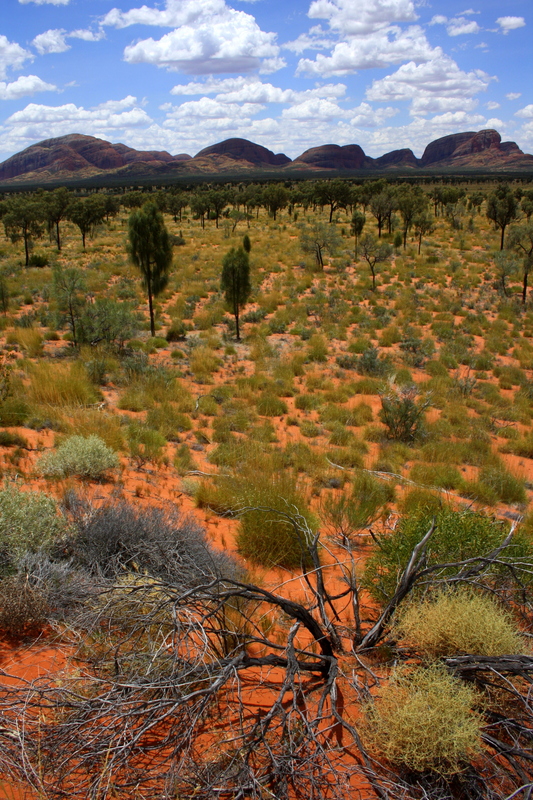 The nearby Kata Tjuta – or Olgas – are about the same age and are thought to have originally been one massive monolith, as opposed to the 36 separate domes they are today. Our guide took us around each site, showing us the rock art in little nooks and caves and explaining the fascinating Tjukurpa cultural heritage, with its creation myths and ancestral journeys (or ‘songlines’). I was even starting to find plausible the account of a god-like worm creating the cracks and crevices on the surface of the rocks. The area is beautiful and the day ended with a barbeque looking out at the setting sun behind Uluru. The best part of the trip by far. Our time in Australia concluded back in Sydney. We stayed in Mark’s flat in Balmain, a pleasant ferry ride from the centre, and explored more of the city. Thanks to Gill’s excellent hosting, we enjoyed a lovely picnic and swim at Chinaman’s Beach on ‘Straya Day, had fish and chips on the beach in Manly, and were pointed in the direction of the best boutique shops and cafés in Newtown and Glebe. We visited the aquarium; had a super-sized seafood lunch at the fish market; enjoyed an Annie Leibovitz photography exhibition at the Museum of Contemporary Art; ate at the fantastic Rockpool restaurant on George Street; walked along the coast from Coogee to Bondi; and visited the freaky Luna Park funfair. And on one of the days we borrowed Mark’s car and drove out to Katoomba to see the Blue Mountains, where we dangled precariously from a cable car high above the Jamison Valley, with stunning views of the Three Sisters and beyond. I also experienced my first one-day international cricket game: England vs Australia at Sydney Cricket Ground. I learned that any sporting outing is made immeasurably more pleasurable when you are wearing thongs (flip-flops) and sunhats and have an esky (coolbag) full of strawberries, Tim Tams and cider. On days like that I can understand why you might uproot yourself and move to the other side of the world. The 22 hour flight home reminded us why we couldn’t do it, but we’ll definitely be back one day to experience more of the country and visit the soon-to-be-married couple and their Aussie brood. 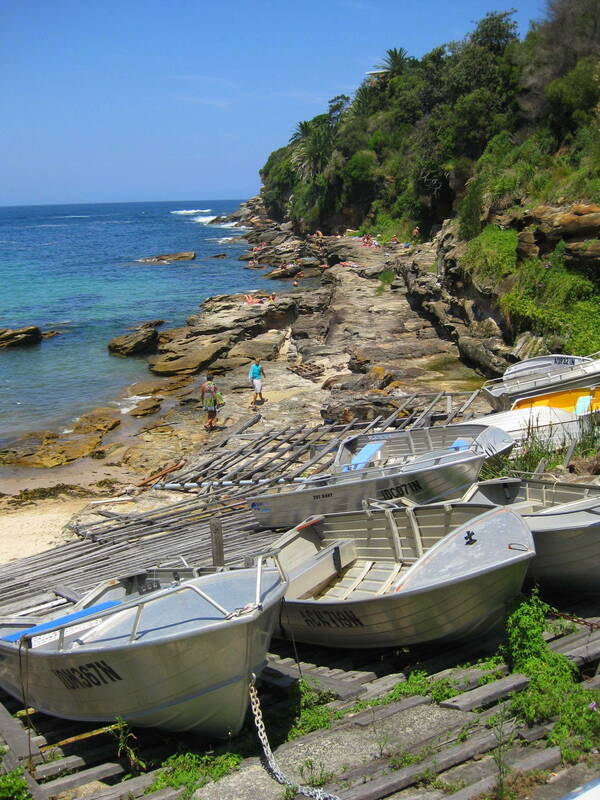 This entry was posted in Travel and tagged Alice Springs, Australia, Great Ocean Road, Kata Tjuta, Melbourne, Phillip Island, Port Fairy, Sydney, Tasmania, Uluru on May 16, 2013 by victoriassecretblog. Oh Vix! 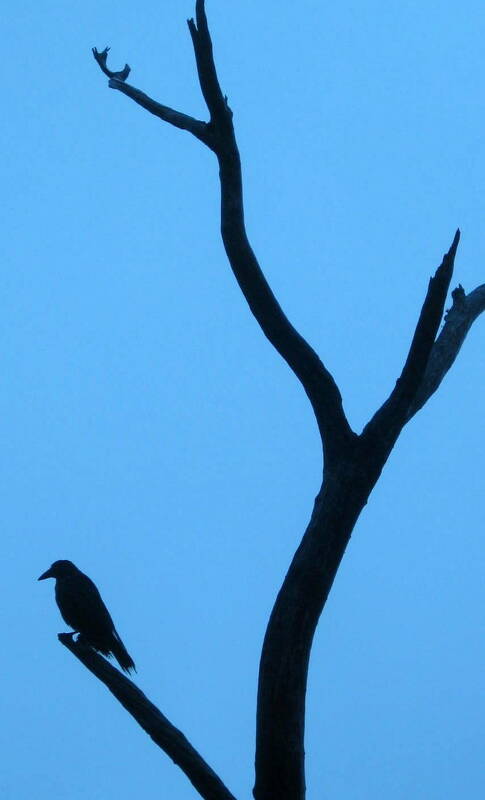 I love every bit of this blog (well except for your cold… And Launceston, generally).